The politically-correct view of the Confederate States of America is one of a nation of backwards, evil good-ole'-boys solely dedicated to the preservation of racism and slavery. This view, espoused in State-approved history books and in Hollywood, presents the war won by Abraham Lincoln to be wholly just and entirely motivated by the pure intention to end slavery in America. This view tells us "North Good, South Bad" and that the horrific number of casualties both soldier and civilian sustained in the war is completely justified by the result. The "revisionist" view, held by many libertarians and other marginalized groups, is generally that the Confederacy was justified in breaking from the Union due to extremely exploitative treatment by the rulers in the North. This view holds that slavery was not the primary impetus for the secession or the war. The secession in this view was actually an attempt to break away from a type of economic/tax "slavery" imposed on the South from the North. Holders of this view generally acknowledge slavery as an evil which must be ended, but that it should end through peaceful means. They hold that the massive numbers killed in the war are not morally justifiable and that slavery could have ended without the war and without subjugating the Confederacy. Those familiar with my work and this blog know that there is are astrological signatures for willingness to do/support evil and its opposite (unwillingness to do/support evil). These signatures are extremely consisent: virtually all mass-killers have one signature and virtually all ethically-consistent human-rights supporters have the other (though having the signature does not mean one will fully enact its noble or horrific potential). Here I define "evil" as "the initiation of aggression", its opposite being "the non-initiation of aggression" or "libertarianism". Most astrological readings of political charts are "astro-poetry". The astrologer finds features on the chart which agree with their personal political interpretation of the subject matter of the chart. The result is often full of insight but there is often no consistent or repeatable methodology behind the interpretation. My work regarding the astrology of political ideologies is, in my opinion, the opposite. It is repeatable, is supported by a massive body of publicly-posted evidence, and strongly suggests that political views and ethical ideologies are in fact astrological in origin. The politically-correct view of the Confederacy ("wholly evil") should then appear strongly in the astrological chart, using my methods, if it is correct. Let us see. Libertarian: Pallas parallel Sun, Mercury, and MC; Pallas sextile Mercury; Pallas square the Nodes at the "North Bending". Authoritarian: Pallas square the Nodes. Pallas square the Nodes suggests struggles with ethics (which usually resolve towards ethical clarity). The rest of the configuration is extremely libertarian (anti-aggressive). I can't recall seeing a stronger libertarian chart for a nation at this time. Capitalist: Venus tightly conjunct North Node. Collectivist: Second-House ruler Mercury quincunx South Node. The signature is, overall, very capitalist. Conservative: Sun, ruling Fourth House, at MC? Liberal: South Node in Cancer. Culturally liberal, from what I can tell. Libertarian, capitalist and culturally liberal. We can't know what things would have looked like had the Confederacy survived. From the chart of its founding, contrary to the politically-correct view, we might have eventually seen a peaceful capitalist superpower with a human-rights record to rival any. Perhaps it would have ended slavery the way every other Western country has: through market forces and political pressure. No nation is perfect and without skeletons in the closet, but this chart suggests a nation that could have grown into an "American Switzerland": prosperous and peaceful. This is not the chart of an evil empire of oppression. It's the chart of what America is supposed to be... economically and politically free, peaceful, and tolerant. See this for Jude Cowell's diametrically opposing view of the same chart. 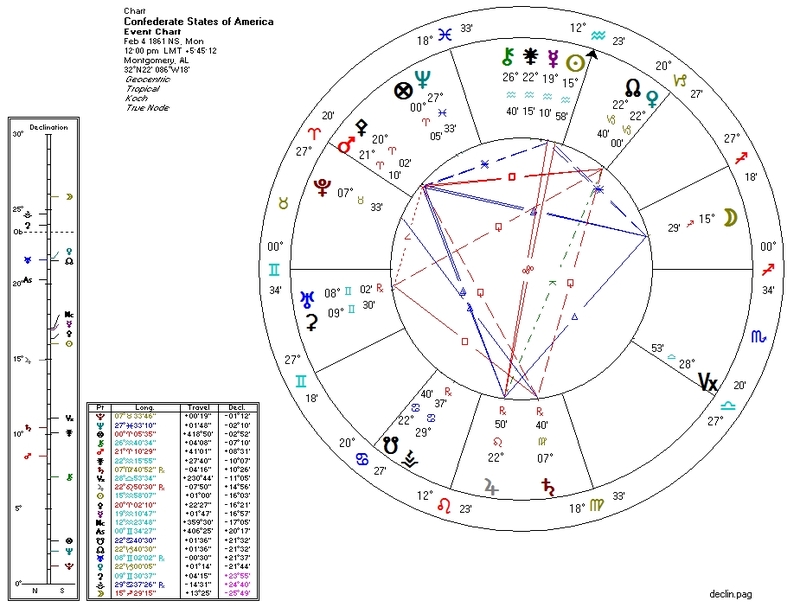 Note: during the Charleston Church Shooting which would trigger an American backlash against the Confederate flag, transiting Sun and Mars were trine the Confederacy's Chiron and transiting Jupiter was opposite the Confederate Mercury. Suggesting injury and conflicting messages.